The 3245-year-old seal on Tutankhamen’s tomb before it was broken, 1922. KV62 is the standard Egyptological designation for the tomb of the young pharaoh Tutankhamun in the Valley of the Kings, now renowned for the wealth of treasure it contained. The tomb was discovered in 1922 by Howard Carter, underneath the remains of workmen’s huts built during the Ramesside Period; this explains why it was spared from the worst of the tomb depredations of that time. KV is an abbreviation for the Valley of the Kings, followed by a number to designate individual tombs in the Valley. The tomb was densely packed with items in great disarray. Due to the state of the tomb, and to Carter’s meticulous recording technique, the tomb took eight years to empty, the contents all being transported to the Egyptian Museum in Cairo. Princess Diana and Prince Harry at an amusement park, April 1992. Although “Princess Diana” is a popular way of referring to her it is incorrect. Diana was, during her marriage, The Princess of Wales and after the divorce was styled Diana, Princess of Wales. During her marriage, she was Princess Charles, Princess of Wales (etc) but this expanded form was rarely seen for the reason that it was seldom used for her husband. Adolfo Hitler talking to Mussolini through the window of a train in Brennero, 1940. 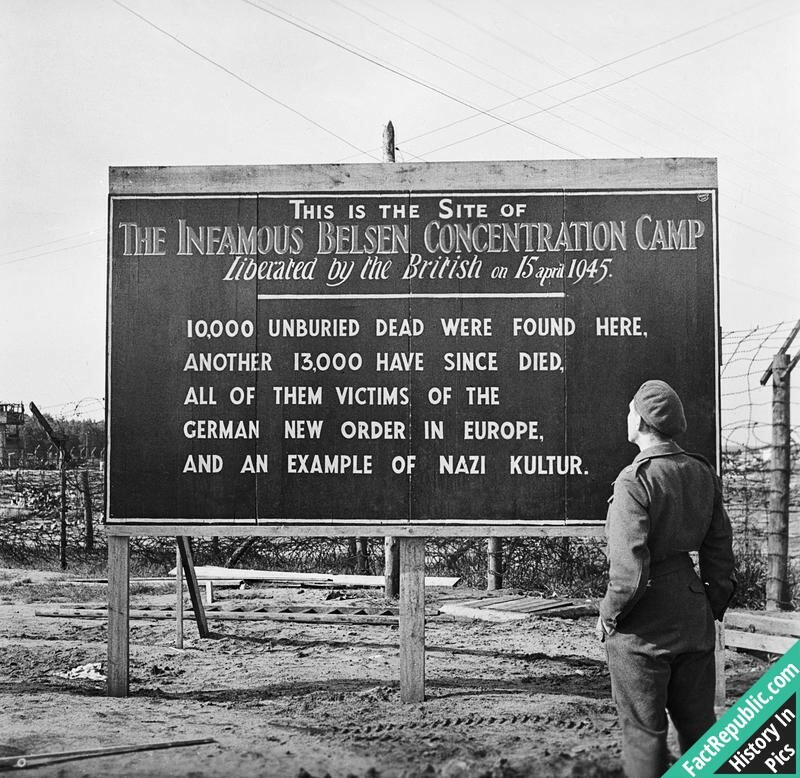 A sign erected by British forces at the entrance to Bergen-Belsen concentration camp, May 29, 1945. I know the “and a million deaths is just a statistic” saying, and the psychology that goes with it. But I think it does make a difference, especially for a community as small as the Jews in terms of raw numbers. The difference between 2 million and 6 million is massive when the Jewish population was around 10 million in Europe. Man eating rice in China, 1901-1904. Only the very first generation of photographic processes, from the middle of the 19th century, required minutes-long exposure times. The wet plate process, introduced more than forty years before this photo was taken, already reduced exposures to a few seconds. The dry plate process got it down below one second. The photographic techniques of the time would have made it hard to capture a shot like this candidly, but as a posed shot, it’s nothing unusual.